Clear View Glass Ltd. offers auto glass repair and replacement in Kamloops. 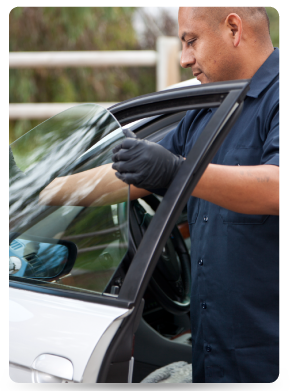 We are fully equipped to complete any kind of auto glass repair you may require. Windshield replacements, ICBC claims, and installation of safety glass, mirrors, and equipment glass are just a few of the services we provide. For added convenience we have a courtesy car available for you to use while your vehicle is being repaired. We can quickly repair small chips and cracks in your windshield without having to remove it. Windshield repairs restore the strength and clarity of your auto glass and save you money. Small cracks in windows that are left unrepaired may become progressively larger until the crack becomes too big to repair and the windshield has to be replaced. Most insurance companies now pay for windshield repairs with comprehensive coverage. Clear View Glass Ltd. repairs and replaces windshields for all makes and models of vehicles, including motorhomes and big rigs. We stock over 150 windshields in two windshield warehouses, one in Kamloops and another in Vernon. If we don’t have your windshield in stock, we can get it and install a replacement promptly and at an affordable cost. We can handle your insurance claim. Call us to receive a quote.